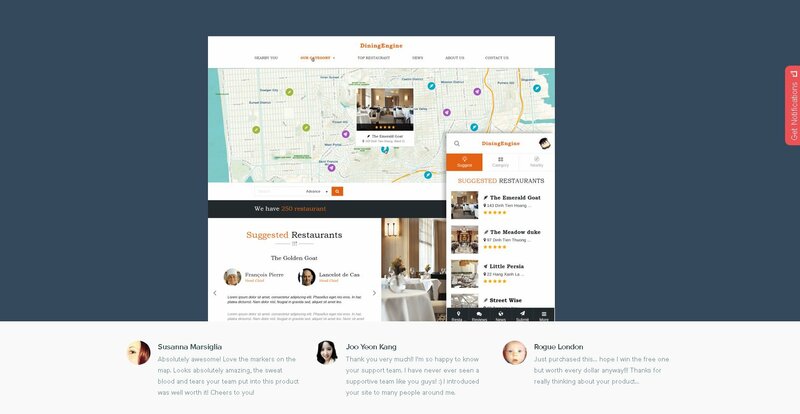 DiningEngine is a powerful & highly customizable restaurant, cafe & bistro WordPress listing directory theme. DiningEngine is a restaurant, bistro, bar directory WordPress theme that monetizes when users posts a submits a restaurant. Site owners can set the pricing plan for different number of posts. Site owners can also use the widget and sidebar system to display advertisements. End users can make a reservation, contact owners and leave a review and star ratings for each post .